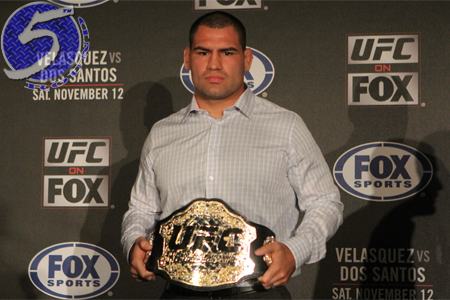 Velasquez will then defend his throne against Werdum at UFC 180 on November 15 in Mexico City. TUF LA will feature bantamweight and featherweight fighters. The Arena Ciudad de Mexico in Mexico City will host the finale. Velasquez underwent surgery on his left shoulder in December and hasn’t been seen since. Javier Mendez, Velasquez’s longtime coach, recently revealed his client still hasn’t received a clean bill of health to resume all-out training. With today’s announcement, Velasquez will get additional time to rehab while coaching his TUF squad. White previously professed the company would not take its talents to Mexico without Velasquez, who is Mexican-American, so they are confident he’ll be ready to answer the bell for UFC 180. Velasquez will be riding a four-fight winning streak into the shootout. He’s lost only once in 14 professional outings, but has avenged his blemish to Junior dos Santos twice in convincing fashion. Werdum solidified his top contender status by posting a lopsided unanimous decision over Travis Browne earlier this month. The upset specialist has won all four of his scraps since returning to the UFC in February 2012.